Here you can find information on the various awards given out by the AMS every year to honour and recognize those in the community who go above and beyond. 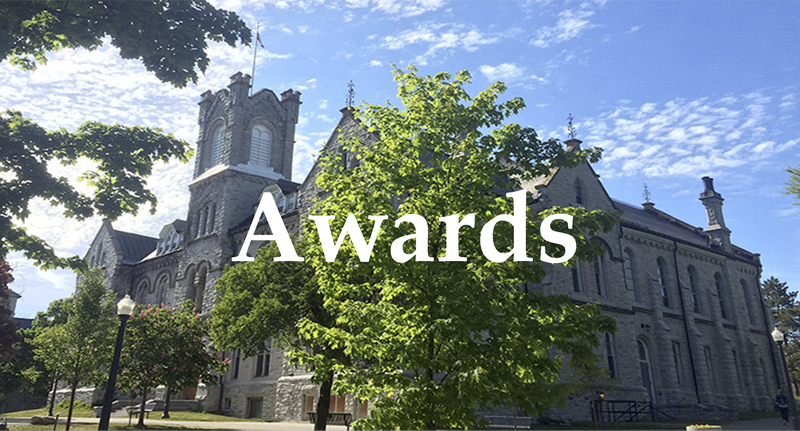 Whether that be as a landlord, an AMS student volunteer, or a teacher these awards serve as our small token of appreciation to the individuals that take the extra time and effort in their respective roles to make the Queen’s community a better place. This person has made one of the largest impacts in the Queen’s and/or Kingston community. They have done this within their own volunteer portfolio and by fostering and promoting AMS member engagement. Notably, they have acted responsibly and professionally as an AMS representative to the larger Queen’s and/or Kingston community. This individual is dedicated to improving the experiences of their fellow volunteers as well as their supervisor. Above all else they are a team player and contribute greatly to a positive working atmosphere through being a support and friend to all. This volunteer is known for going above and beyond what is required of them from their job description. This may mean reaching outside or attempting to reach outside of their portfolio for the better of their committee, their commission, and/or the AMS as a whole. Every time this person is set a task they complete it to the best of their abilities each and every time. One of these descriptions sound like someone you know? Fill out the nomination form by March 21st! The purpose of the Frank Knox Award for Excellence in Teaching is to recognize and acknowledge Queen’s University professors that demonstrate an outstanding commitment to the education of their students through their remarkable teaching. The award is named in honour of Frank Knox, a professor of economics who taught at Queen’s from the 1920’s to the 1960’s. Professor Knox demonstrated tremendous dedication in his teaching of undergraduates. As a result, the Award serves as a reminder to all, teachers and students alike, of the necessity of a strong commitment to the high quality of teaching at Queen’s. This is a student initiative wherein students at large are responsible for determining the recipients of the award each year. Each year, the AMS presents an award honouring several teaching assistants who have demonstrated an outstanding commitment to the education of students of Queen’s University. This award is named in honour of Christopher Knapper, the founding Director of the Instructional Development Centre (IDC). During his time as the Director of the IDC, Chris Knapper showed genuine concern about the needs of students and did a great job of furthering the educational environment at Queen’s. This is a student initiative, wherein students at large are responsible for nominating the recipients of the award. This is the inaugural year for the Undergraduate Research Mentorship Award. This award is meant to honour the contributions of professors that have encouraged undergraduate research at Queen’s. This comes in many forms, such as thesis supervision, inquiry projects in the classroom, or supervising a capstone project. This is an initiative to recognize excellent mentorship of undergraduate scholars. The nominations are not confidential. This is a student initiative wherein students at large are responsible for nominating the recipients of this award. The Golden Key Award is the AMS’s distinction for outstanding landlords in the Queen’s community. This award serves to advance student housing in Kingston through promoting landlord accountability and the improvement of property standards. The house with the nomination for the winning landlord also gets a pizza party! The Civic Responsibility Award is given out each year to a Queen’s student who has significantly contributed to the Kingston community. This contribution may be through volunteering with one or more Kingston organizations or with a student group that performs volunteer work in Kingston. Volunteer commitments may not be a requirement for the student’s academic program. The Robert Sutherland Prize is awarded annually to a self-defined student of colour who has shown leadership and initiative at Queen’s, most specifically in the areas of anti-racism and anti-oppression in the aim of creating a more inclusive campus environment. To nominate someone, you must submit a list of the nominee’s activities and a brief description of their contribution, along with a list of individuals who may comment on their contribution to the Commissioner of Social Issues. Nominations are due April 2nd at 5pm. This award is given annually to students who make an outstanding contribution to the Alma Mater Society and Queen’s University in the year that the award is granted, and who hold a position (or positions) that otherwise would receive little appreciation or recognition. All questions can be directed to the Vice President (University Affairs) at vpua@ams.queensu.ca. Click here for the 2016-2017 nomination form! Submit your nomination before March 17th, 2017. The AMS Peer Support Award is open to all students, not just volunteers of the AMS, and celebrates students supporting students on campus. The award is granted each year to a student who has made a remarkable impact through supporting others and demonstrates a passion towards helping those around them. Please click here for the nomination form! Due by March 17th, 2017. The purpose of this award shall be to recognize staff members employed by Queen’s University who consistently provide outstanding contributions, directly or indirectly, to the learning and working environment at Queen’s University at a level significantly beyond what is usually expected. Two currently-enrolled students may make the nomination and any member of the Queen’s community (student, alumni, staff, faculty, co-workers, supervisors, and members of the public who have an interest in the University) may submit supporting nominations with a maximum of five letters of support being accepted. Nomination letters should note the nature and type of contribution made by the staff member, the breadth of the staff member’s impact, evidence of initiatives to develop and/or upgrade work skills, and length of service. Nomination letters must be submitted all together in one envelope, with clear indication as to (a) name and contact information of the nominators and (b) name and contact information of the nominee. Envelopes may be submitted to the AMS Front Desk on or before March 17th.